Hannan senior Malachi Cade (3) tries to dribble around a Wayne defender during the second half of Thursday night’s non-conference boys basketball contest in Ashton, W.Va.
Hannan senior Logan Nibert, middle, tries a shot attempt between a pair of Wayne defenders during the second half of Thursday night’s non-conference boys basketball contest in Ashton, W.Va.
ASHTON, W.Va. — It was close for nearly three quarters. Visiting Wayne made a 40-14 surge over the final 9:35 of regulation while turning a four-point lead into a sizable 88-58 victory over the Hannan boys basketball team on Thursday night in a non-conference matchup in Mason County. The host Wildcats (1-3) trailed all but 26 seconds of the contest, as the Pioneers (3-1) overcame an early 3-2 deficit with a Zach Perry basket at the 7:20 mark of the first period and ultimately led the rest of the way. 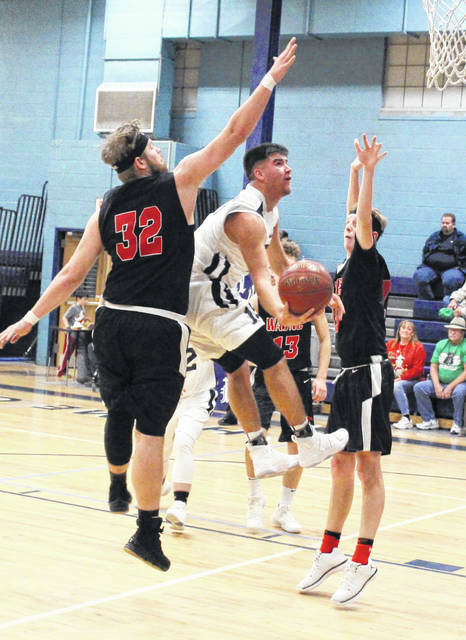 The Blue and White, however, never trailed by more than a dozen points through three quarters of play — and they managed to keep things quite interesting over that span. WHS — behind a 9-of-18 shooting effort in the first canto — stormed out to 19-7 edge with just 38 seconds left, but an old-fashioned three-point play from Logan Nibert seven seconds later allowed Hannan to whittle the lead down to three possessions through eight minutes of action. The Wildcats followed with five straight points to start the second stanza, but the Red and Black answered with an 8-0 run to extend their lead back out to a dozen (27-15) with 5:28 remaining until halftime. Hannan responded with an 11-3 charge over the next three minutes to pull back to within 30-26, then closed the final 2:05 small 6-4 run to enter halftime trailing 34-32. The hosts twice closed to within a single point at 36-35 and again at 38-37 following a Nibert bucket with 5:57 left in the third, but Wayne answered with a small 10-7 run over the next four-plus minutes to establish a 48-44 edge with 1:40 remaining. The Pioneers, however, made a small 6-2 run over the final 95 seconds of the third to claim a 54-46 cushion headed into the finale — and the Wildcats were never closer from there. WHS made its first eight shots of the fourth quarter — including four trifectas from Gunner Daniels — that resulted in a 76-48 advantage with 4:02 left in regulation. The guests went to lead by as many as 32 points on three different occasions before ultimately claiming the 30-point triumph. 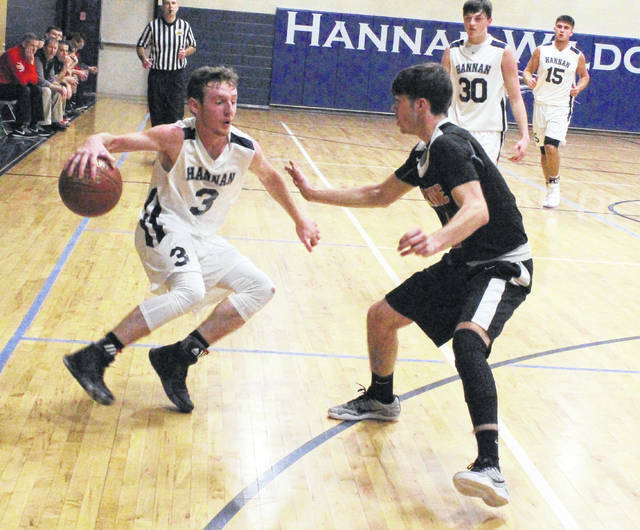 Hannan missed its final 11 three-point attempts and went just 5-of-15 from the field in the fourth quarter, as well as 11-of-31 overall in the second half. Wayne, conversely, went 22-of-34 from the floor after halftime and netted 13-of-18 shot attempts over the final eight minutes of play. After hanging tough for roughly 24 minutes against a school more than twice its size, HHS coach Becky Ferrell felt that her troops played about as well as they could — given that they are missing three players from their 10-man roster. But, as she also noted, there are still some other things that Wildcats need to keep working on as the season progresses. “Honestly, we just ran out of gas in the fourth quarter. We only have seven players to rotate in and out right now, and you could tell that we worn out in that final quarter,” Ferrell said. “We’re battling injuries and we are continuing to work on our conditioning, but it was hard for us to battle a whole bench-full of players that Wayne had. The Pioneers outrebounded the Blue and White by a sizable 42-28 overall margin, including a 15-7 edge on the offensive glass. Wayne also committed only a dozen turnovers, compared to the 18 miscues by the Wildcats. Hannan connected on 22-of-56 field goal attempts for 39 percent, including a 5-of-25 effort from three-point range for 20 percent. The hosts were also 9-of-16 at the free throw line for 56 percent. Malachi Cade paced HHS with 22 points, followed by Nibert with 20 points and Dalton Coleman with 10 markers. Devrick Burris, Matthew Qualls and Andrew Gillispie completed the scoring with two points apiece. Qualls led Hannan with seven rebounds and Nibert hauled in six caroms, while Cade and Gillispie respectively grabbed five and four boards. Wayne sank 37-of-71 shot attempts for 52 percent, including a 7-of-23 effort from behind the arc for 30 percent. The guests were also 7-of-12 at the charity stripe for 58 percent. Perry — easily the biggest player on the floor for either squad — turned in a dominant performance with a double-double effort of 26 points and 13 rebounds, both game-highs. Daniels was next with 18 points, followed by Corey Marcum with 17 points and Devin Hall with 10 markers. Gavin Meadows also added eight points and 11 rebounds to the winning cause. Kameron Atkins and Darian Maynard completed the WHS tally with respective efforts of five and four points. 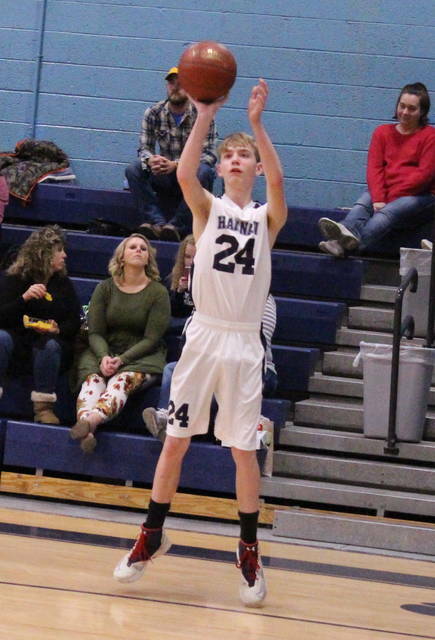 Hannan returns to action Friday (Dec. 29) when it travels to Mason for a varsity girls-boys doubleheader at Wahama. The boys contest will begin at approximately 7:15 p.m.